Southeastern Kodiak Island, Midway Bay south to Three Saints Bay and Sitkalidak Island. See area map (Image file 57 kB). This area has a diverse topography and ranges from boulder-strewn beaches and tidal flats to low ridges to rugged peaks to 4470' with permanent snowfields and glaciers. The village of Old Harbor (population 311) is located within this hunt area and has regular scheduled mail flights. Sitkalidak Island is primarily grass covered with alder hillsides and the highest point at 1835'. Lands around Sitkalidak Island, Midway Bay, and the head of Barling Bay are owned by Old Harbor Native Corporation. with the exception of some State land in the southwest corner of Sitkalidak Island. 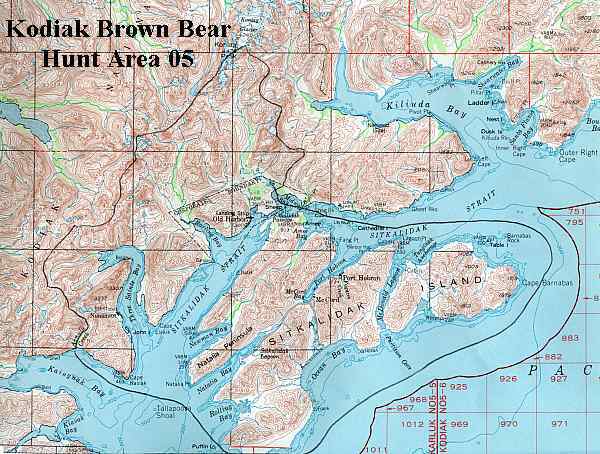 The remainder of this area is made up of Kodiak National Wildlife Refuge lands. There are private lands in several areas along the coast.